Capacity: 55 bilion cubic meters per year. Partners: Gazprom, Wintershall, E.ON, Gasunie, Engie. The Nord Stream pipeline became operational in 2011. First proposed in 1997, disputes between Kiev and Moscow in 2006 and 2009 prompted Russia to stop natural gas flows through Ukraine, depriving Europe of natural gas and accelerating Nord Stream construction. 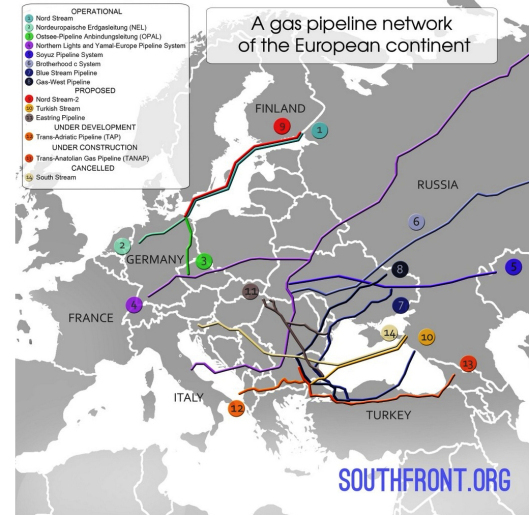 The pipeline enables Russia to deliver energy directly to Germany and parts of Central Europe. Capacity: 20 bilion cubic meters per year. Partners: Gazprom, Wintershall, E.ON, Gasunie, Fluxys.